via Hwy 287B, Peden Rd. and Morris-Dido-Newark Rd. Founded around 1848 - Dido was once a thriving community named for a mythical Queen of Carthage. The town had its own post office, stores and a promising future until it was bypassed by the railroad in the 1890s. The most obvious reminder of the former town is the 1,000-grave Dido Cemetery. The earliest grave in the Dido cemetery is that of one-year-old infant Amanda Thurmond (1878-1879) granddaughter of an early settler. �At the north end of Eagle Mountain lies a town that is forgotten but not lost. We found the slab of the post office at the corner of Peden Road and FM 1220. The growth of Fort Worth is moving north and the growth of Alliance Airport is moving south. Right in the middle of both of those growth booms lies Dido, Texas. The oldest church in Tarrant County sits here, the Dido Methodist Church. The Dido Women�s Club are the caretakers of the community center and the Dido announcements sign. Anchoring the town is Blue Bayou. It is a ghost town in all its character and charm. All it needs is a mayor and a post office box and it will be back to its glory days. [It is] still rich in the historical sense, as well as the ghostly. Rumors are the bridge at Indian Creek is where Cullen Davis threw his earthly goods into the lake. Dido dogs still roam but are eerily quiet for they never seem to bark. There are many parts of the town where the noise of parties can be heard, but there are no houses or inhabitants on those spots. 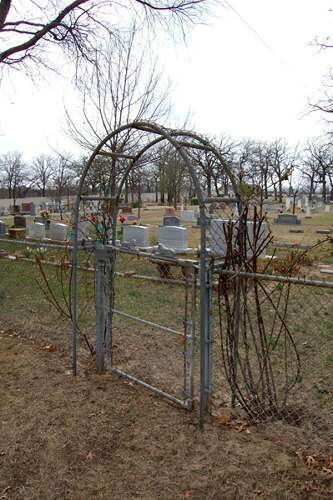 The earliest marked grave in this cemetery is that of Amanda Thurmond (1878-1879), granddaughter of Dave Thurmond, who in 1848 first settled this area. 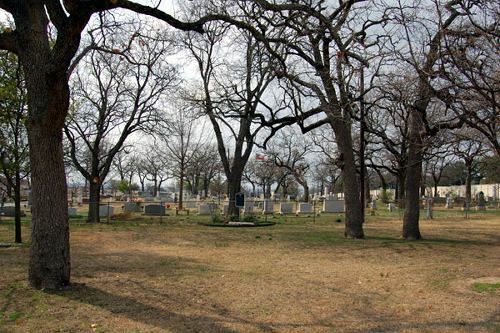 Dempsey S. Holt donated three acres in 1887 for a school, church and cemetery. Dr. Isaac L. Van Zandt, a pioneer physician and Confederate veteran, deeded additional land in 1894. The Village of Dido was named for the mythological Queen of Carthage. A thriving community with a post office and stores, Dido declined after the railroad bypassed it in the 1890s. Among the 1,000 graves here are those of many pioneer families. Dear TE, I descend from Phereby Turner & John Smith. John Smith's will was dated in 1805 Anson County NC. I have traced [the family] back to Sir William Harris who married Alyce Smythe/Smith, the sister of Sir Thomas Smythe who was the Treasurer of the Virgina company and was appointed by the King to settled Jamestown after the first two failed attempts. He was also Ambassador to Russia, Governor of the East India Company, and held other other notable positions. His father [also] Sir Thomas Smythe, was wealthy enough to donate sums to Queen Elizabeth I so that England could arm against and defeat the Spanish Armada. I believe this is the reason my Smith got the abundant land grants from the King of England. England owed them a debt for helping save the country. The Smiths that migrated westward were so prominent and respected that other families gave their children the first name of Smith. Texas' Smith County had many Smiths settle there. My name is Barbie Williams and I'm on the Dido Cemetery Board of Directors. We still have "Dido Days" every year on the last Sunday in April. This year it will be on April 30th at 12:30 PM. We still have a picnic, and a business meeting there at the cemetery. Weird as it may seem, a picnic at the cemetery is really pretty neat. At least it is at Dido. I believe it is one of the most beautiful and well kept cemeteries there is. One gentleman has been coming to Dido Days for nearly 90 years. He said he remembers coming for the "yearly cemetery clean-up" in a covered wagon with his parents. Nowadays Dido is maintained year round so we mainly just meet to conduct business and have food and fellowship. I can't believe you have a website. I used to come with my grandparents, Ruby Caldwell Hill and George Earnest Hill to the "reunion" at Dido in April in the 60's. They used to meet in the spring to clean the cemetery, but when we went, it was mainly a get- together with lots of good food. Amanda "Mandy" Thurmond, the first person buried there was my granddaddy's (G.E. Hill) aunt, the twin sister to his mother, Mary Thurmond. Mary and Amanda's parents, Jim and Rebecca Thurmond lived in Dido. Mary Thurmond married Allen Hill. According to my mother, Mary Sue Hill Ingram, her grandfather, "Daddy" Allen was a boisterous, "good will" man, a town organizer. He had a chair on his front porch and would "holler" greetings to the townsfolk as they passed by. She said he was pall bearer at everyone's funeral, probably due to his size. Anytime he met someone who was hungry, he would invite them to his house to eat. His wife, Mary, was a small woman, evidently a very good cook. She also visited the neighbors every day and was quite a talker. My grandaddy said she visited the neighbors because Daddy Allen never let her get a word in at home. The best story Mother told me was of Daddy Allen selling watermelons to raise money for the Dido cemetery. She said he had the watermelons iced down in big barrels and was slicing and selling them with a flourish. What a picture! I don't know how many descendents I have in Dido from the Thurmond and Hill families, but my grandparents and my Daddy, Frank Douglas Ingram, are buried there. It's a beautiful place with lots of trees and a view of Eagle Mt. Lake. I have very fond memories of my time with my grandparents there. On your website, you state that: "In 1887, land was donated for a school, church and cemetery. 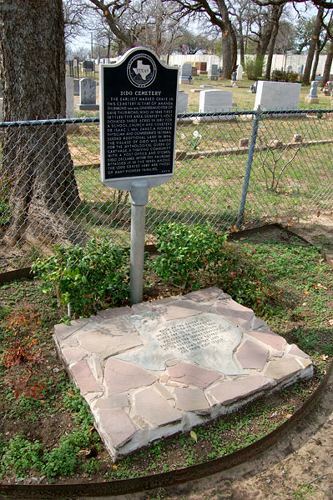 Additional land was donated in 1894 by Confederate veteran Dr. Isaac L. Van Zandt - the namesake of Van Zandt County."